The deer eventually found the exit. 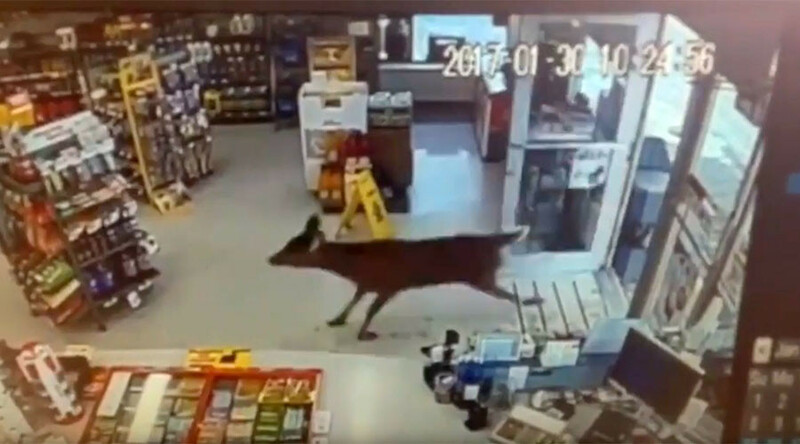 A Canadian gas station was left destroyed after three confused deer ventured inside and, in a panic, kicked up a storm. They eventually found their way out, but not before leaving the station attendant with a giant mess to clean up. “There was pop bottles on the floor, and candy and papers, deer hair and a little bit of blood,” Bertrand Beaulieu, who witnessed the event, told Global News. Footage from inside the New Brunswick station shows the deer sliding on the floor and wrecking the shelves. Beaulieu believes the deer entered the store after venturing too close to town and becoming panicked by their surroundings. A video posted to Facebook shows a very polite gentleman holding the door open for the deer as they run back to the wild. Another posted video shows the aftermath of the deer’s shopping trip. No estimate of the cost of the damage done to the station has been released and it is unknown whether the deer will be billed for it.